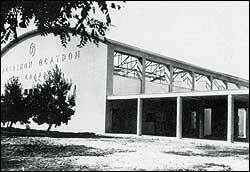 The National Theatre of Northern Greece, seated in Thessaloniki, was founded in 13 January 1961 and inaugurated its activity in the summer of the same year with performances of ‘’Oedipus Rex’’ by Sophocles at the Ancient Theatre of Philippi. Its first president was the writer Giorgos Theotokas and its first director Sokratis Karantinos. In December 1961, the N.T.N.G. staged its performances in Thessaloniki, at the Royal Theatre (Vassiliko Theatro), while in autumn 1962, it was located at the new, at the time, building of the ‘’Society for Macedonian Studies’’. Its aim, from the time of its establishment, was the presentation of plays of Greek and world dramaturgy, the realization of tours in Northern Greece and the whole country (since 1962), the production of ancient drama and classical plays, in ancient and open theatres, and cultural events in relation to theatre and art in general. NTNG was the first theatre in Greece which established repertory performances. At the same time, it organized a series of literary matinees. Since 1973, the Drama School of NTNG provides gratuitously full theatrical and generally artistic education, constituting a ‘’seedbed’’ for young actors. In December 1977, the Children’s Theatre Stage was instituted. In December 1982, the dance group ‘’Aenaon Dancetheatre’’ lead by Daniel Lommel, became part of the NTNG. Finally the Opera of Thessaloniki was founded in 1997 as a separate part of of the NTNG, and was merged with the NTNG in accordance with law 4002/2011.